My niece Jacquie is Unicorn Crazy (it's a recognised affliction) - she's suffered for years! 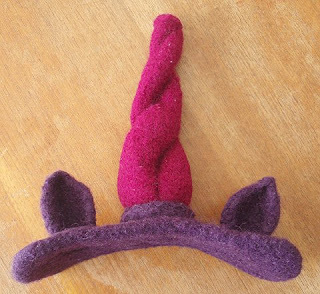 So I decided to make her the Unicorn Headdress from New Knits on the Block by Vicki Howell (Rav link). The Book Review got in the way of knitting time, so this is a few weeks late for her birthday - but nevertheless, it's done! Here are all the bits - 2 long 'horn' sections (long tapering tubes), 2 ears, a headpiece, and a 'base' bit. 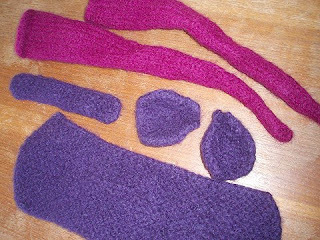 Here they've been felted (machine wash). I used Lincraft's Cosy Wool. Sewing the horn onto the headpiece ... curved upholstery needles are the way to go! 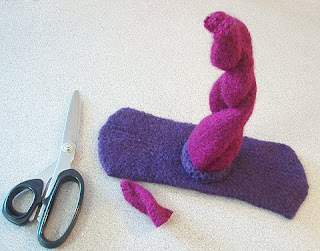 Although the pattern doesn't call for it, I put a bit of stuffing (polar fleece scraps) into the base of the horn. 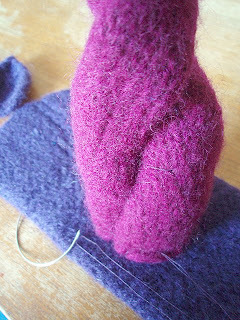 After discussions with Dotter, Hubby, and the Felting Goddess, Olivia, it got the chop, and a second felting session! So here it is, with ears, and MUCH more solid and sturdy! I decided against adding the ring of brightly coloured novelty yarn around the base of the horn. I just need to add an elastic strap for it to be completely done, and then FINALLY Jacquie will get her 8th birthday present! 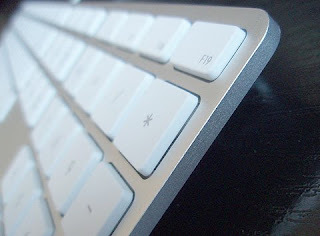 This blog post brought to you today with the assistance of my new Mac keyboard - bliss! I've been clunking away on old grubby keyboards for years - this is my first brand new one, and I loves it!! So thin! Looks great! Can't wait for a modelled pic, I think it could really suit Dotter actually! What a beautiful unicorn crown. She will love it. Waddaya mean I can't snigger? *snort*. she is going to love it. 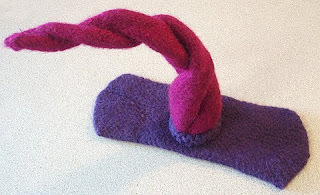 Isn't felting great, don't like it try again. Aren't you a clever clogs???? Lulu needs a crazy unicorn hat!